Hi crafty friends! 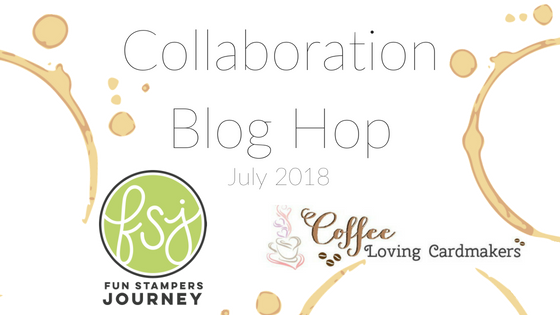 Today is the Coffee Loving Cardmakers & Fun Stampers Journey Collaboration Blog Hop and it's Dana here with two fun shaker cards. If you came from Becca Cruger's blog, you are on the right track. I'm sharing full blog hop list in the bottom of this post and please check it out if you need. For my first card, I started by die cutting 3 cups as shown from A2 sized kraft card stock. I stamped coordinating images with StazOn Jet Black after I adhered clear acetate behind the panel. Before I built shakers, I ink blended some pieces of paper for each background. I used Mermaid Lagoon, Shaded Lilac, Squeezed Lemonade, Spiced Marmalade, Twisted Citron and Worn Lipstick Distress Oxide inks. I then white heat embossed the sentiment and stamped other images here and there with Versafine Vintage Sepia. To finish, I created multiple shakers using foam adhesive and clear sequins and mounted shaker panel onto white card base. For my second card, I began by die cutting cup elements from watercolor card stock and vellum. I then adhered clear acetate behind it and built a shaker using foam tape. I then watercolored background softly with Gansai Tambi watercolor paints. Once it dried, I stenciled some waves with distress inks as shown and applied glitter pen to them. To finish, I mounted 'smile' and other embellishments using Ranger Multi Medium Matte. To be eligible for the prize, please leave comments on all participating blogs. Commenting will close on Friday, July 27 at 11:55 pm pacific. Your next stop is amazing Dana Warren's blog! Happy hopping! Dana Gong <-You are here! Your sparkles and sequins are adorable on your cards! Sweet as can be! Agree with Linda C-- the sparkle card reminds me of bubble tea and is so cute! Such great use of color! Love these shakers! So cute. Love your fun and creative use of shimmer and shine. 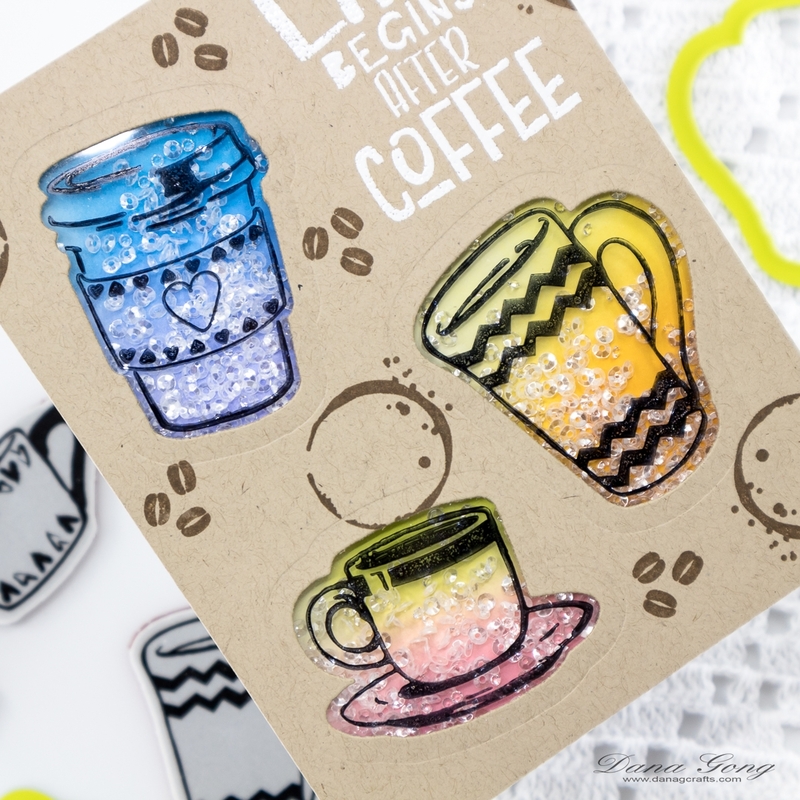 I love the chunky glitter over the bright coffee cups! Such awesome cards! I love the shaker effect and the rainbow-licious inking! The waves on your second card are just too fabulous!!! I really like the bright colors and the sequins are adorable! Dana! I LOVE them both! So FUN! Love your pretty shaker cards! You have totally stretched my way of thinking on card making! I absolutely love your ideas, the beautiful colors, and bling used! Thank you so much! Great cards, I especially love the one with kraft paper. What a standout!!! I'm shake...shake...shaking with excitement to try these colorful shaker coffee cards! I think these are my favorite shaker cards I've ever seen! Love your unique cards--so much inspiration! Your shaker cards are so cute! I have to confess, I've never made one before. This might be just the inspiration I needed! Great cards! 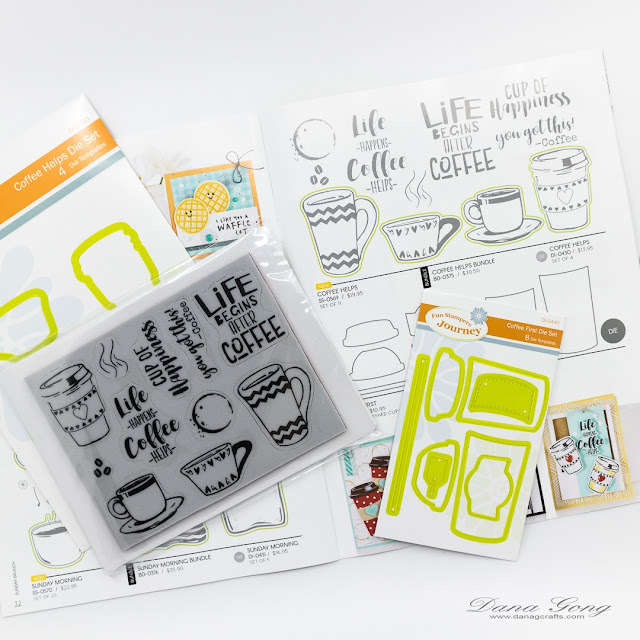 I love that they are shaker cards and the shaker elements are so fun!!! Your shaker cards are adorable. I love that use of sequins makes the card so colorful. Cute cards. The three cups with the color backgrounds is my favorite. the sequins are an awesome idea!!! What a great addition to the card! I love, love, love shakers! Love them both, of course. Love all the sparkle of the first one and then all the confetti colors in the 2nd, too. Oh my gosh! Shaker cards!! How fabulous! That first card with the 3 shakers is my favorite so far! What did you use to fill in the shaker bits? Love the sparkle and color choice!!!!! I especially LOVE the color blends behind the shakers. The many colors of sequins in the second card make my eyes want to linger! I love these, they are adorable! Awesome shakers! 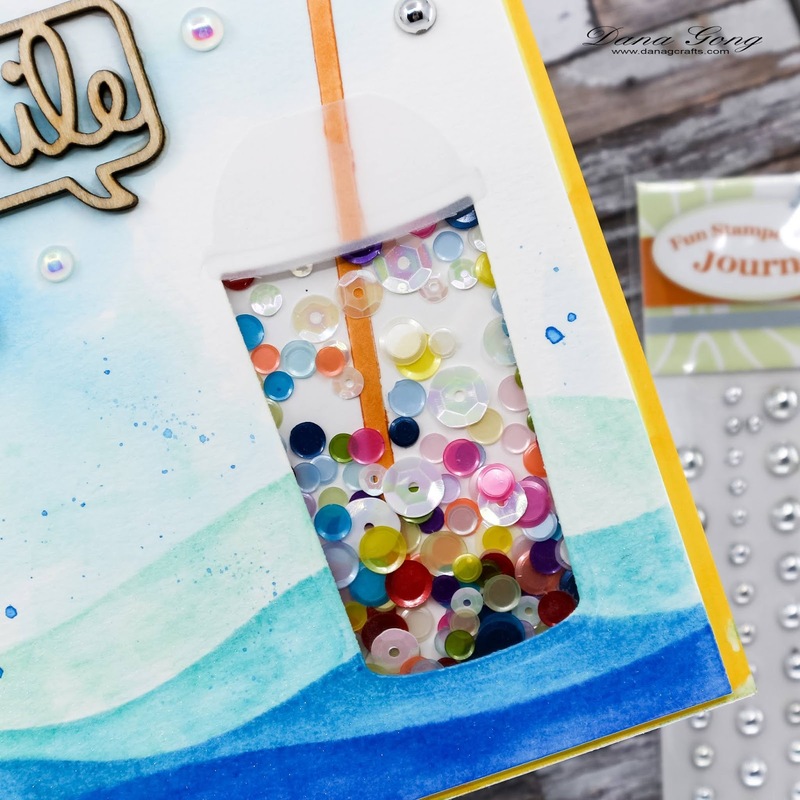 Love the beautiful soft colors in the shakers along with the kraft cardstock and the beautiful clear sequins... and that fantastic wavy background along with the so colorful shaker! Love them both! Your cards are amazing!! Love the colors on your watercolor background and the icing on the cake (I ❤️icing!) was the sequins and color dots (?) you had on the shaker cup!! Gorgeous!!! I love shaker cards and both of yours are fantastic! Triple shaker card = triple the fun! Beautiful colors too. love, love, love them both! fantastic backgrounds for the shakers on the first and the second is adorable too! Shaker coffee cards? YOU WIN THE HOP! LOVE! 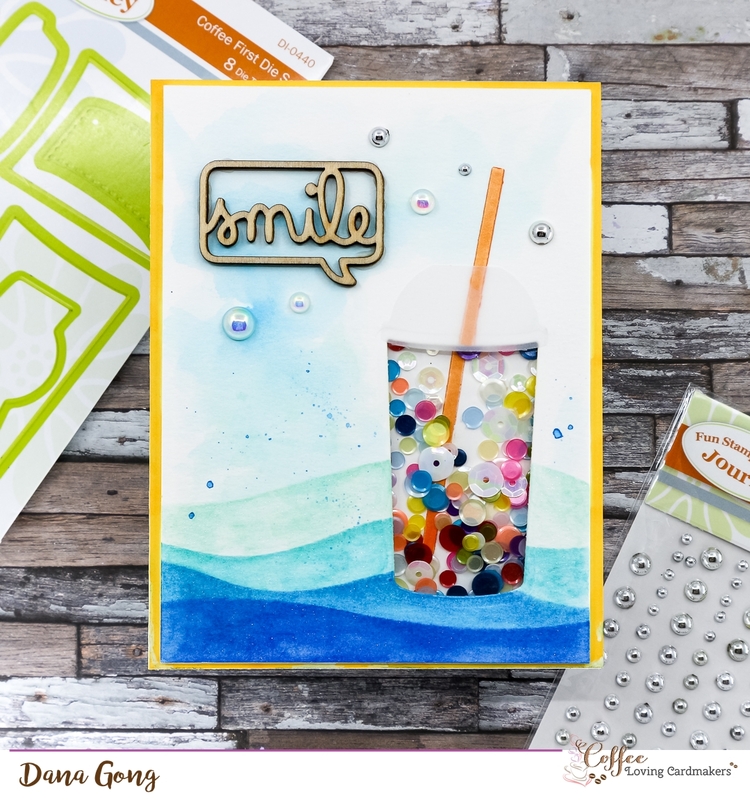 I So love your shaker cards, it reminds me of Bubble tea! AMAZING SHAKER CARDS! Just so very cool! I really like the color blends for the top card very pretty! Cool cards!! Such small shakers!! Bright, sparkly, shiny and happy. Fantastic shaker cards! Awesome shaker card! Your other c adds are awesome too! Love the color blending and the shakers-too cute! Oh my goodness!! I love your cards! Awesome shaker designs and the colors... amazing! Very creative! Love Shaker Cards! Love all the colors! Amazing Cards! I love shaker cards and these you made are amazing. All are so well created. I'm just a glitter and bling girl myself. Just loves the blending and use of color too. you did an awesome job on your cards, I especially love the fist one! Dana, Your cards are so much fun and very creative, Thanks for sharing these beauties! Love these colorful coffee shakers. Wow!! These shaker cards are amazing!! Shaker card so cute, love both of your cards. Great idea for a shaker! I love the wild shake-up of bright colors, and glitter is ALWAYS a winner! 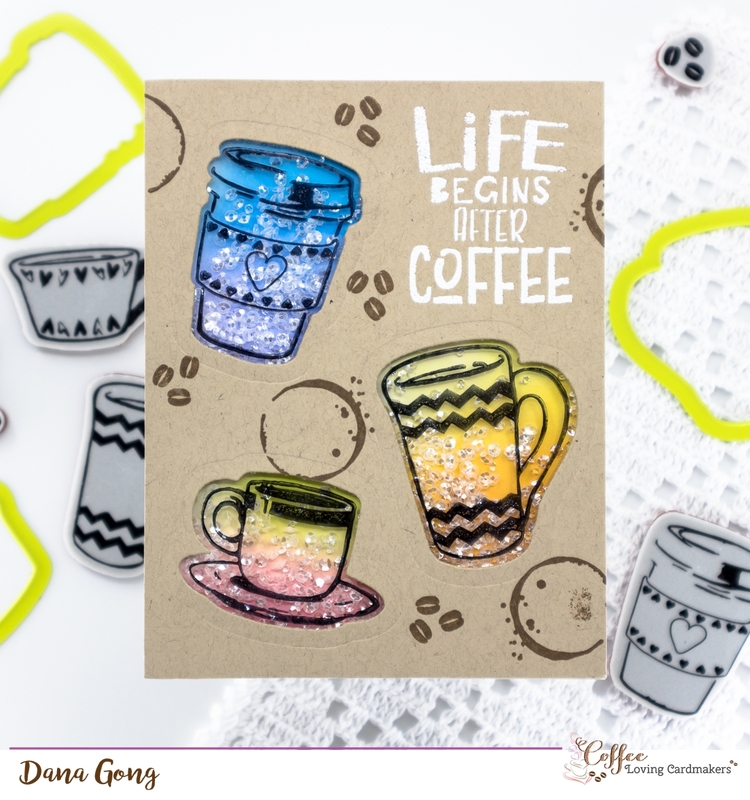 What amazing coffee shaker cards! Each one is so fun, colorful, and creative! Shaker Coffee Card! What a great and creative idea. Dana, your cards are so gorgeous!!! The first one with all the bold glitter and deep colors on kraft is so beautiful!! The second with the shaker element is so inspirational!!! Great ideas and terrific products to show case!! Love your cards! Great choice in colors and I love the sparkle! Amazing work. Dana, your cards are super fun and gorgeous!!! I LOVE LOVE LOVE the designs a lot. Love that you did shaker cards and how you used the distress oxides. The shakers are SO CUTE!!!!! Shaker cards are always fun! I love your cards and these cards are no different! Love the shaker! These cards are so fun. Loved the rainbow colors and the use of acetate on the first card. The 2nd card just reminds me of summer and having a good time. Loved them both. Love shaker cards! Great job!